What is Eczema a skin disorder that includes inflamation characterized with redness and itchiness. Signs and Symptoms of Eczema Eczema may manifest on the face, scalp, hands, arms, feet, or legs. Babies may have eczema on large areas of the body. Nutrition and Diet for Eczema Treatment The importance of proper nutrition and diet to people with eczema Avoid foods that tend to trigger eczema outbreaks. Supplements for Eczema Vitamins and minerals supplements may be taken to prevent, and minimize the effect of eczema attacks. Visualization Therapy for Eczema Studies have shown that anxiety and stress are causes of eczema flare-ups. Visualization can help alleviate and prevent the eczema flare-ups and attacks. Herbal Medicine for Eczema Herbal medicines that were found to help alleviate the onset of eczema. Medicinal Measures for Eczema Prescription antihistamines or hydrocortisone maybe given for persistent eczema attacks. Warning Signs for Eczema There are other skin disorders that has the same signs and symptoms for eczema. It is best to consult your doctor. Eczema, also known as atopic dermatitis, is a chronic, inflammatory skin disorder. Eczema is the inflammation of the upper layer of the skin. It is characterized by redness, skin edema, dryness, scaling, flaking and itchy rashes or blisters. Eczema is usually dry and itchy because too much moisture is lost from the skin’s upper layer. Loss of moisture from the skin makes the skin without protection against bacteria and viruses. The disease occurs episodically; there may be periods when symptoms are severe (flares) and there are periods when there is no symptoms at all (remission). Eczema is not contagious, but it is very common. Eczema affects between 9% to 30% of children or teenagers in the United States. Eczema may disappear by teenage years but to some it may be lifelong There is no cure for eczema, but treatments can reduce symptoms and help prevent outbreaks. Dry, leathery areas of the skin that has different pigment from the rest of the skin tone. Eczema symptoms may manifest on the face, scalp, hands, arms, feet or legs. Babies may have eczema symptoms on large areas of the body. In older children and adults, eczema symptoms occurs (and recurs) in only one or a few spots, especially on the hands, upper arms, in front of the elbows, or behind the knees. Doctors do not know what causes eczema (atopic dermatitis), however, eczema is thought to be caused by a combination of hereditary (genetic) and environmental factors. 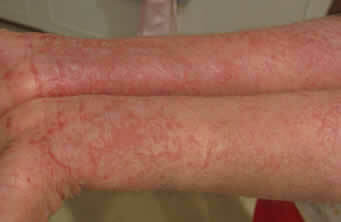 We do know however that there are certain things that can cause eczema to "flare-up", or to worsen. This means that factors such as allergies can cause eczema in susceptible people. Eczema symptoms occur when the immune system in people's skin overreacts to environmental or emotional triggers. Allergies to dust, pollen, mold, animal dander, etc. Chemical irritants, such as pesticides, cosmetics, astringents, perfumes, harsh soaps, detergents, household cleaners and others. To treat eczema, it is our objective to reduce the symptoms of eczema including itchiness, dryness, flaking and inflammation, and to prevent its recurrence or flare-ups. Treatment methods may differ according to age, symptoms and the general health of a person with eczema. The following are suggestions to accomplish this. .
Merck Medical Dictionary, Eczema-Atopic Dermatitis. M. Castleman "Blended Medicine, The best choices in healing, Eczema"
Atopic dermatitis (eczema) Mayoclinic's website. Bathing and Moisturizing at National Eczema Association's EASE website. Treating Eczema at The Eczema Society of Canada's website. Lee NP, Arriola ER (1999). "Topical corticosteroids: back to basics"
Van Der Meer JB, Glazenburg EJ, Mulder PG, Eggink HF, Coenraads PJ (1999). "The management of moderate to severe atopic dermatitis in adults with topical fluticasone propionate. The Netherlands Adult Atopic DermatitisStudy Group". Omega-3 can soothe eczema. Dermatology Times (March 27, 2008). New Skin-healing Chemicals. Science Daily (August 30, 2007). Palmer, C.N. et al. (2006) Common loss-of-function variants of the epidermal barrier protein filaggrin are a major predisposing factor for atopic dermatitis. 'Blood chemicals link' to eczema -BBC News, 26 August 2007.